A delightful collection of shelving and cabinetry are present in our Amish Pine Wood End Table Cabinet with Hand Painted Design Option. Create the framework for your living room or use this handy pine end table in your foyer, hallway or bedroom. Two shelves provide room for remotes and other small items, while a small pine drawer is perfect for holding keys for easy retrieval. The raised pine door panel, complete with pine knobs can be custom made unfinished, in your choice of stain or paint, or with a hand painted design to add to its charm. Consider our Amish Farmhouse Shaker Coffee Table to complement this pine cabinet. 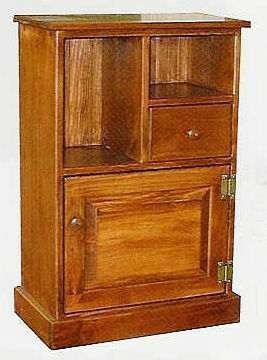 This pine wood end table cabinet complements your cottage pine furniture or country pine furniture collection easily. Call one of our Amish Furniture Specialists today at 1-866-272-6773 with any questions.